Remember the horrible bridge collapse in Minnesota a few years ago? 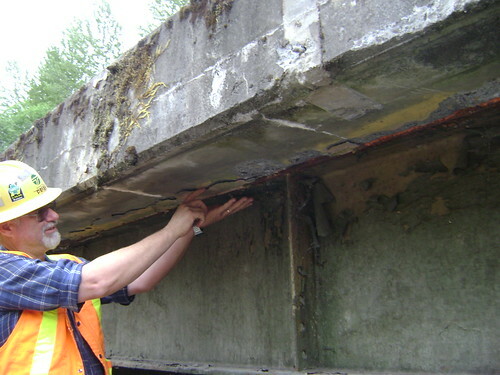 The same could happen in thousands of places all over the country - upwards of ten percent of all bridges in the United States have been deemed as structurally deficient or obsolete. Remember how millions of people lost their jobs a few years ago? That was horrible, too, and it's an ongoing disaster. Over 9% of the workforce remains out of work and many more are underemployed. There’s some good news when you look at the two problems side by side, however. Solving the problem of our crumbling infrastructure would employ millions of Americans. We’ll need more workers to manufacture the steel and mix the concrete. We’ll need more people to manufacture the tools and equipment to repair these bridges. We’ll need more construction workers to finish the job. Those construction workers will need to eat, so local restaurants will get a bump, hiring more workers and buying more from suppliers. The ripple effects go on and on: creating jobs, repairing vital infrastructure, creating efficiency for commuters and suppliers all over the country.That's where you come in. To ratchet up public pressure on Congress to create these jobs and rebuild America, we're collecting photos of crumbling bridges, roads, schools and necessary infrastructure from across the country at http://www.workthatneedsdoing.org/americandream/. I'm betting that with 11 percent of America's bridges deemed structurally deficient, at least one of them is in your area. There are probably schools that need repair and highways that need a little fixing, too. So take pictures of them and upload them here. We'll collect them and give them to Congress to show them the work that needs to be done in their districts. Once you've uploaded your picture, make sure that you share this with friends and family around the country. The more photos we have, the harder it will be for Congress to remain inactive on jobs creation. Remember, there are millions of hours of work of work that need doing, and millions of Americans looking for work. So let's do something about it.